Father Time is usually depicted as an elderly bearded man, dressed in a robe and carrying a scythe and an hourglass or other timekeeping device (which represents time's constant one-way movement, and more generally and abstractly, entropy). This image derives from several sources, including the Grim Reaper and Chronos, the Greek Titan of human time, reaping and calendars, or the Lord of Time. 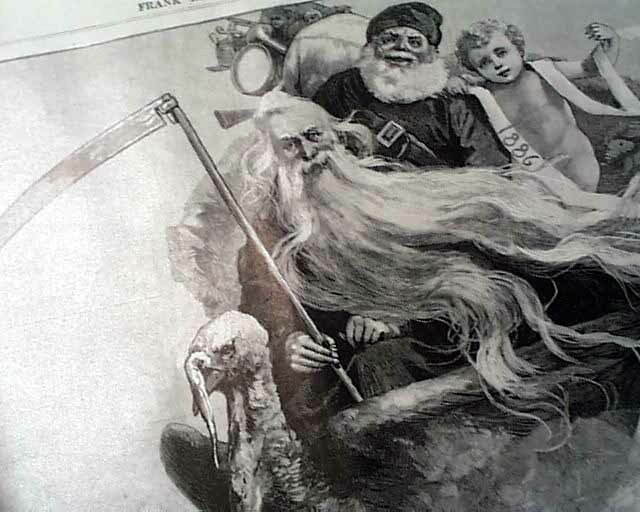 Around New Year's Eve, the media (in particular editorial cartoons) use the convenient trope of Father Time as the personification of the previous year (or "the Old Year") who typically "hands over" the duties of time to the equally allegorical Baby New Year (or "the New Year") or who otherwise characterizes the preceding year. In these depictions, Father Time is usually depicted wearing a sash with the old year's date on it. There is one duty of Father Time's that most people don't know, realize, or consider. That is the close friendship with Santa Claus. Do you really think it is possible to deliver all of those presents in one night without any type of time travel manipulation? Where do you think that comes from? Well, some believe that it is Father Time himself pausing or freeing for everyone but Santa Claus, while other believe that Santa has learned a few tricks from Father Time. There is another group that believes it is a combination of both; either way, something is going on in order for Santa to accomplish his task all in one night.